There's no doubt Echo Beach was the perfect venue for this show. With its ersatz beach sand pit and the sun hanging low in the sky as the magic hour approached, the outdoor stage looked downright idyllic as Perfume Genius sauntered onto the stage. Some of the crowd remained seated on their folding chairs and beach towels as the younger members of the audience stood at the front in anticipation. The wistful, easy-listening yet emotive sound of Perfume Genius was the perfect warmup to Sigur Rós, and the set from the live three-piece wasn't hampered by the summer cold Mike Hadreas explained he had caught recently. Despite planes sporadically taking off from the nearby airport, the set brought several highlights, including a delicate interpretation of Neil Young's "Helpless." 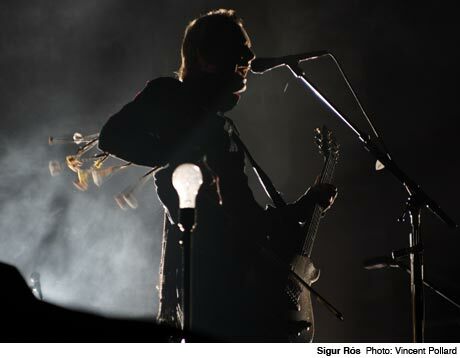 Sigur Rós hit the stage just as daylight was finally fading. Starting off with a pair of tracks from their new album Valtari, they soon treated the crowd to an old favourite, and a wave of cheers went up as the Icelandic post-rockers segued into an intro-less version of "Ný Batterí." Employing a different light treatment for each song, the band made beautiful use of projections and lighting, with each song dominated by a different colour. By the time they played "Vaka," the sky was completely dark and the moonlight behind a few stray clouds was the only natural light, illuminating only the perimeter of the venue. Another favourite, "Sæglópur," was followed by an emotive version of "Svefn-g-englar" as dry ice drifted out from the stage. Images of faces were just visible under a projection of water on the screens behind the musicians. "Hoppípolla" came next, the band clearly making sure the majority of the crowd pleasers in their repertoire got played tonight, with Jónsi delivering a solid performance throughout the Ágætis Byrjun-heavy set. After a brief exit, the band came back onstage, bathed in pink light, for a two-song encore ending in a blistering rendition of "Popplagið" with that Peter Hook-esque bassline coming to the fore in a rare menacing moment as the track built steadily to climax. The band left the stage to the sound of feedback as images half lost to static dissolved into nothingness.